Online Music Store Digital Music Stores vs Digital Music Apps, What Should You Choose? Digital music download had a bright and brief existence before getting overtaken by digital music apps. This is the thought of most people and while it might be right to some extent, it is also not exactly fitting. Most people discredit digital music stores claiming music streaming is the future. There are different views on this which we might not indulge at this time. But digital music stores have their set of advantages as compared to the digital music apps. With digital music stores, you own the music you buy. Download the songs you want and you get unlimited access. Whether you are online or offline or whether you have a subscription or not. Once you download the music, you own it and can play it at any time anywhere. 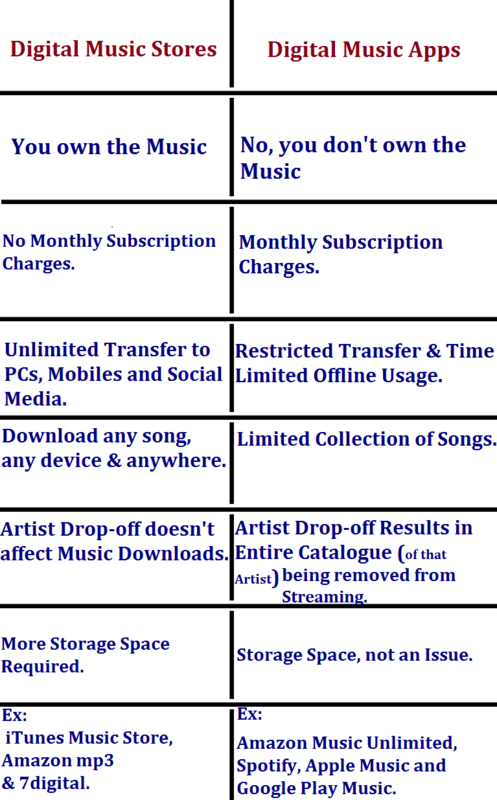 For digital music apps, you pay a monthly subscription for the same music over and over again. It might not seem like much,but you keep on paying and paying as long as you want to listen to the music. Digital music apps offer an amazing way and value for discovering new music. But if you are not listening to new tunes, you are paying for nothing that you can’t get out of a digital online store. With digital music stores, once you download the music, you can take it anywhere. You can copy the music from your phone to the PC, you can send it to friends via WhatsApp and other services. You can also use it on as many devices as you want whether you are online or offline. With the music streaming services, you can only use the music on a limited number of devices. And you are restricted to the number of songs and playlists you can save and how long you can listen offline. Despite having stable catalogues, music streaming services can sometimes fail you. There are still times when something you want won’t be found. Sometimes you can cruise through all of the streaming services without finding the song or album you want especially the most recent ones. And you end up buying or downloading the music to keep for yourself. There is no guarantee that the deals in place to keep an artist’s collection will always stay intact. Having your own catalogue means you can find what you want and in different varieties. You can download live performances, videos and different versions of the songs and have complete control. All this said and done; music streaming services can’tbe pushed to the side. They are the future of music for those people who want to have everything on the go. There are music enthusiasts who have serious connections to music. To them, music is not just music,but they want the best quality there is for the music. This happens to be a considerable number of people and most of them prefer digital music apps. They offer high-quality audio that plays with no noise on any music system. For the digital downloads, you will have to find third-party apps that can download music from sites like YouTube to get good quality music. It won’t be available on the go and if you don’t have this, you will have to cruise through the internet searching for the best quality. With digital music downloads, you must have a lot of storage space to store the music you want. Remember you are downloading from the internet and storing it on your phone or PC and this will require space especially for high-quality audio and videos. With music streaming apps, you can watch these videos and enjoy a wide range of music online without storing anything on your phone or PC. This means you don’t need a lot of storage space. Install the app, pay for a subscription and start playing music. Music streaming apps have vast music libraries with some ranging to 40 million songs available for streaming. This means if you want a song or an album released a few years back, you can access and listen to it anytime anywhere. With digital music downloads, you have to search for some songs individually and you still can’t find most of them,or you find them after a good struggle and waste of time. This one depends on the tastes and preferences of the user. However, if you want access to music anytime whether online or offline, digital music stores will serve you best. If you want exclusive music from specific artists, music streaming services serve you better. Access to millions of songs or access to your owncatalogue? The consumer best defines this. However, the future of music is the Digital Music Apps with most of them offering way more than the digital music stores can offer.